In a speech before the UK parliament today, Prime Minister David Cameron addressed the Syrian refugee crisis, the counterterrorism measures being taken to combat the Islamic State, and other related issues. Confirming press accounts, Cameron said that three British nationals have been killed in recent airstrikes carried out by the UK and US in Syria. And British intelligence believes two of them were involved in planning attacks in the West. Reyaad Khan, a British national, and two of his “associates” in the Islamic State were killed in a Royal Air Force (RAF) drone strike on August 21. The three men were “traveling in a vehicle in the area of Raqqa,” Cameron explained. One of Khan’s two compatriots was a UK national named Ruhul Amin. Three days later, on August 24, Junaid Hussain perished in an American airstrike in Raqqa. “So we had no way of preventing his planned attacks on our country without taking direct action,” Cameron said. Last year, Khan was featured in an Islamic State propaganda video alongside two others from the UK. 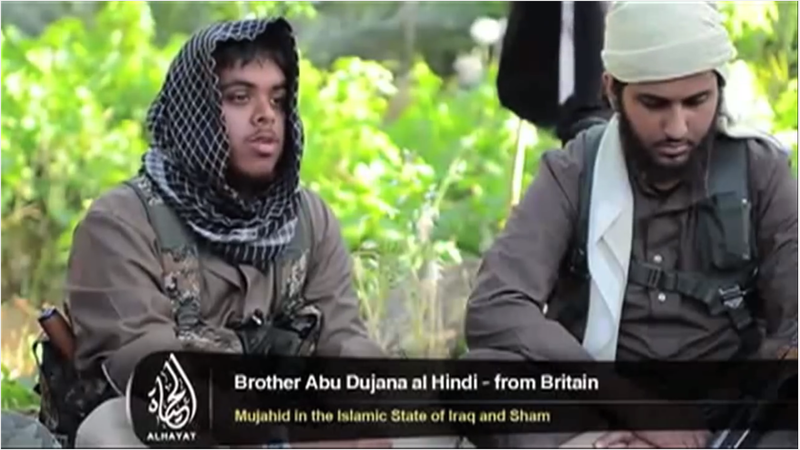 Khan was introduced as “Brother Abu Dujana al Hindi – from Britain” in the video. Khan and his comrades called for others to join the jihad. Even before he relocated to Syria in 2013, Hussain had built a reputation as a hacker. He broke into former Prime Minister Tony Blair’s digital address book and posted some of its contents online. The stunt landed him several months in jail in 2012. In Syria, Hussain reportedly helped lead the “IS Hacking Division” and the “cyber caliphate.” The latter claimed credit for obtaining CENTCOM’s passwords for its Twitter and YouTube pages in January. Both pages were temporarily rebranded with imagery from the “cyber caliphate,” which also posted information on US personnel. Press reports fingered Hussain as one of the main suspects behind the CENTCOM social media hackings. Hacking web pages and address books wasn’t Hussain’s only specialty. In one iteration of this Twitter feed, “Abu Hussain Al Britani” (believed to be Junaid Hussain) listed his user names for several encrypted applications, saying that anyone interested in carrying out attacks could learn how to do so using the apps. After his death, some high-profile Islamic State supporters blamed Britani’s use of apps that aren’t totally secure for his demise. Abu Hussain al Britani’s Twitter presence drew suspicion in May and June, when his comments seemed to indicate ties to terrorists and extremists in the US. On May 3, two gunmen opened fire at an event dedicated to drawing images of the Prophet Mohammed in Garland, Texas. As first reported by the SITE Intelligence Group, Britani quickly claimed the gunmen were acting on behalf of the caliphate. Then, in June, Britani claimed on Twitter that he had encouraged Usaamah Rahim, an Islamic State supporter, to carry a knife in case anyone attempted to arrest him. Rahim was shot and killed by police in Boston after allegedly wielding a knife. Cameron is just one of the many bozo’s elected to lead many of the countries now trying to explain away or excuse their collective incompetence & naivete. So some guy now hangin out in the Iraqi Syrian Theater fightin for ISIS/ISIL is ‘revealed’ by ‘Intelligence’ to be scheming against the West with some dark sinister plan designed to inflict pain, ‘punishment,’ mayhem, murder, etc., on the West. WOW! What a major revelation & to think the Fumblelina’s in the Intelligence Community managed to reach these conclusions all on their own. If you think ISIS or al Nusra want to talk to us you obviously aren’t listening to what they say. Try reading DABIQ some time. they’ll talk to anybody. Just because one doesn’t get the response they’re seeking in no way precludes them from talking. Don’t think for one minute these guys won’t consent to a sit down. These are very savvy, clever, cunning, etc., people many of whom are ex Baathist’s who served under Saddam. Saddam never had problem indulging in talks of any sorts with anybody & these ISIS/ISIL are no different. While you’re at do some research on Suruc & Turkeys MIT relationship with ISIS/ISIL/IS. Al Nusra & Turkey’s MIT? If so then you should spend some serious revisiting & researching just how all these Moslem Nations & ‘Groups’ ‘Operate’ & conduct affairs betwixt each other. Well, the strikes themselves benefit Assad, despite what conspiracy theorists on the Internet might say. The West already is helping Assad, there’s just been no official public reconciliation. I doubt there will ever be one. Personally, I don’t see much of a difference between the rigid philosophies of Nusra/Islamic State or the Shiite entities. The only real difference between them is that one ideology is on the fringes while another is a vast, powerful and accepted worldwide entity that commands respect and influences countries. At their core, they would have no problem making the world become just like them. And that doesn’t disturb me anymore, it’s fact. They say it themselves quite often. It does not matter whether they were planning to kill people back in the UK. They were Isis and deserved to be killed. the Defence Secretary was right when he said he would do it again.